Curious on How to Improve Patient Collections at Your Practice? Attend Our Webinar September 27th! 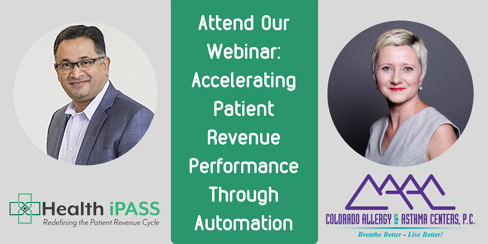 Hey, we can talk all day about how all the features and benefits of our patient revenue cycle solution, but if you want to hear the fantastic return-on-investment (ROI) one of our partners has achieved, Colorado Allergy & Asthma Centers Director of Patient Finance Office Kate Cullip will be discussing how Health iPASS addressed and improved patient revenue cycle performance including how her practice was able to reduce patient self-pay days in accounts receivable by 11 from January 2018 to June 2018! Kate will also discuss additional ROI achieved along with patient and staff reactions to the Health iPASS platform. The webinar will conclude in a Q & A session where attendees can talk directly with Rajesh and Kate regarding the discussion points in the presentation. Don’t miss this chance to gain valuable, actionable insights from healthcare finance leaders working to improve the patient revenue cycle.